Brian Chan, a professional fisheries biologist, has spent most of his life studying the insect life of trout lakes. Brian will share the secrets of what happens in that underwater world and how it will help you to catch more fish. If you’ve ever had a tough day fly fishing for trout on a trout lake it can make you wonder why it is the way it is. There are many times that we face circumstances that we just can’t seem to explain. Listening to what Brian Chan, a fisheries biologist, has to say could just be what it takes for you to turn that tough day on the water into a productive day on the water. 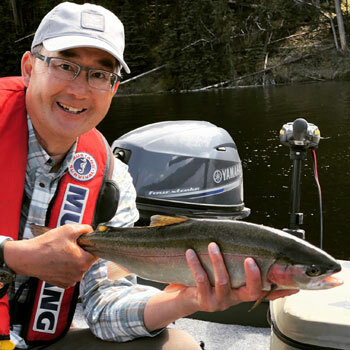 Brian Chan is a professional fisheries biologist who has managed small lake recreational fisheries and promoting and marketing freshwater fishing in the province of British Columbia for the past 30 years. He is a fly fishing author, producer, lecturer, and an angling guide. Some of his most recent works include the books Morris and Chan on Fly Fishing Trout Lakes, Stillwater Solutions Recipes – 30 Proven Patterns with co-author Phil Rowley, and the DVD Expert Techniques for Stillwater Fly Fishing. Chan is also a regular contributor to various fly fishing magazine publications, a regular guest on several fishing shows, and is a co-host of the New Fly Fisher Show. He is affiliated with Sage, Mustad, Rio, Islander, Superfly, and Outcast Sporting Gear. According to Brian, a fisheries biologist’s job is a mishmash of different activities. His whole career was devoted managing recreational trout fisheries – setting regulations, defining and managing to specific regulations and producing certain types of fisheries. He also does work on habitat protection, inventory work, and development management plans for various lakes within a particular area. There are three types of trout lakes: eutrophic, mesotrophic, and oligotrophic lakes. Eutrophic lakes are the lakes that are usually fished for trout. They are shallow and usually have intermittent or no inlets or outlets, meaning that that they have a very low flushing rate so they don’t have a lot of water mixing through them. The soils and geology around it make them nutrient-rich so that they grow insects and other food sources of fish. Oligotrophic lakes are the least productive. These are the big, ocean-type lakes. They have extremely high flushing rates so that the nutrients don’t stay long in the lake. Mesotrophic lakes are deeper lakes that typically have streams or small rivers running in and out of them. This brings about a high flushing rate, which means that the water is replaced regularly. These are less productive than eutrophic lakes. Eutrophic lakes are the ones that you should focus on when fly fishing trout. You can have these lakes in British Columbia, across Canada, across the northern states, and southern states. Lakes such as these are usually less than 50 feet deep. The best fishing lakes are those lakes that are landlocked. Eutrophic lakes typically have a spring and fall turnover. During winter, no photosynthesis occurs, and consequently, there are no green plants. Therefore, the fish will just survive on the oxygen left from the day the ice formed on the water body. If the winter is extremely long, eventually there would not be enough oxygen to support the fish which brings about a winter kill. When the lake turns over in the spring, a very rapid drop in oxygen levels occurs in the entire lake because the water in the upper layers mix with the less oxygenated water in the lower layers. This combined with the upwelling of hydrogen sulfide and methane gas makes the fish very uncomfortable and they go off the feed. The worst that could happen during this time is a spring kill where the fish die two weeks after the lake has come off. During spring turnovers, the water becomes turbid for three to five days, clears up, settles out, the entire water column becomes saturated with oxygen. Brian’s advice is that when you see that a lake has a lot of debris in the water, don’t fish there because the lake is turning over. Brian Chan says, "You can go down lower in elevation to catch a lake that’s already turned over or you go higher in elevation to catch a lake that hasn’t turned over." A lot of eutrophic lakes develop a thermocline which is an invisible barrier that forms like a sheet of plastic across the lake. Above it, the water is warm, but below it, there will be a rapid drop in temperature. This actually acts as a barrier to mixing. The wind can blow all at once but it won’t mix the water below the thermalcline on a well-established thermocline. In most eutrophic lakes productive trout lakes don’t often have a lot of oxygen below the thermocline. In worst case scenarios, there would not be enough oxygen to support trout. The fish will sit just above the thermocline during the day where the water is cool and well-oxygenated. Alkaline lakes are lakes higher than with a pH greater than 7. They are the most nutrient-rich and have the most diversity in aquatic invertebrates or food sources for trout. To determine if a lake is acidic or neutral, you can look at the aquatic vegetation in the lake. If the shoreline is covered in lily pads with pink flowers, pond weed, or potamogeton, the water will have a pH that is neutral to acidic. An alkaline lake, on the other hand, usually has native species milfoil, coontail, honwort, and Chara. A low pressure system moving to a high pressure system would stimulate more insect activity because there is an impact of air pressure that goes below the surface of the water. The rising barometer usually brings in warmer air temperature which are more favored by an insect that going to emerge and pop out from the surface of the lake. The emergence of an insect depends on water temperature. Prior to their emergence, the pupae or nymphs rise or swim through the water column. If everything’s right, they will make their way up to the surface of the lake. Once they are committed to the nymphal swim or pupal rise to the surface of the lake, they are committed. Rainy cloudy days are more conducive to Calabaetis and Baetis mayfly hatches in stillwaters. Chironimids or midges, on the other hand, will come off in a blinding snowstorm. If you have a rapidly dropping or crashing barometer, Brian advises you to employ different tactics. One of these is using attractor-style patterns that agitate the fish into biting things like flashy bright flies stripped quickly to the water. You can use streamer patterns with colors like bright orange and bright Chartreuse green. These tactics will "get most of our fish mad and them chasing the fly". During winter months, lakes can be aerated. However since every lake is unique, you have to make an individual assessment of each of those water bodies. The water body has certain parameters. For example, a lake should be 20 to 25 feet deep so that the aeration will be effective. One of the negative effects of aerating a very shallow pond is that you will “super cool” the water which impacts invertebrate biodiversity in the lake. It also affects growth rates of fish and insects in the lake. Trout only care about how much energy they have to expend to get the greatest benefit. They want to spend the least amount of energy for maximum amount of food because they don’t want to expose themselves to predators. That is why even if trout love to eat the larva early in the spring and late in the fall, once the pupa are around, they will go after them since they are a lot easier food source for them. According to Brian fly fishing trout lakes is not so different in the east and west. "If you use the techniques to mimic or imitate the different stages of life cycles, it doesn’t matter where you are on the continent, they’ll produce fish for you."